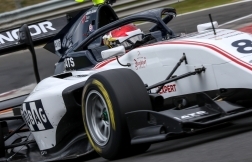 It was a weekend of FIA Formula 3 European Championship firsts for Fabio Scherer at Spa-Francorchamps in Belgium, with the Swiss driver claiming his first podium, his first Rookie class victory and his first experience of leading an F3 race. The icing on the cake for Fabio was a stellar drive to P2 that enhanced his reputation as one of the fastest young drivers on the grid. Having started the second race of the weekend from P7 in his Dallara-Volkswagen, it took Fabio less than four laps to move up to P1. 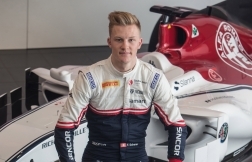 He then had a thrilling slipstreaming battle for the lead with Motopark team-mate Dan Ticktum, with both drivers taking turns at the front before Fabio had to settle for P2. “It is always a good feeling to lead a race, although I could see in my mirrors that Dan was using the slipstream to catch me,” Fabio said. “When he got ahead I was able to stay close, but I ran a little bit wide at the chicane on the penultimate lap. 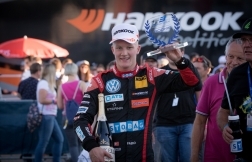 The 19-year-old backed up his podium finish by storming from P18 on the grid to finish P9 in the first race, but his performance in race three on Saturday morning was even more spectacular. From P10 on the grid he briefly moved up to P6 on a damp-but-drying track. But halfway around lap one, another driver made contact with the rear of Fabio’s Stobag-supported car and pushed him off the track. Fabio rejoined in P24 and his assailant was penalised by the race stewards for causing the incident. Despite the setback, Fabio was the quickest driver on the track as he performed an overtaking masterclass, setting the fastest race lap of the entire weekend during his recovery to P10. “I’m frustrated at getting taken out because I think I could have won that race; my car was really strong both in traffic and in clean air,” he explained. Giving Fabio further confidence is that fact that he is the only driver on the grid to have scored points in each of the past five races. With the 30-race championship now at its halfway point, he is P12 in the overall standings and P6 in the Rookie classification. “We have to work on some small areas but I have to thank my team for all their hard work and support this weekend. I know quite clearly where I need to improve and I still have a chance to finish the championship in a good position,” he added. 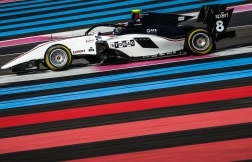 The next FIA F3 European Championship event takes place at Silverstone, another circuit Fabio believes will suit his hard-charging driving style, on 17-19 August.